Combined AGOA imports (including GSP provisions) 119,564 118,324 #VALUE! #VALUE! #VALUE! Combined AGOA imports (including GSP provisions) 737 1,107 #VALUE! #VALUE! #VALUE! Combined AGOA imports (including GSP provisions) 1,214 926 #VALUE! #VALUE! #VALUE! Combined AGOA imports (including GSP provisions) #VALUE! #VALUE! #VALUE! Combined AGOA imports (including GSP provisions) 600,959 565,580 #VALUE! #VALUE! #VALUE! Combined AGOA imports (including GSP provisions) 19,540 23,232 #VALUE! #VALUE! #VALUE! Combined AGOA imports (including GSP provisions) 3,746 2,677 #VALUE! #VALUE! #VALUE! Combined AGOA imports (including GSP provisions) 6 154 #VALUE! #VALUE! #VALUE! Combined AGOA imports (including GSP provisions) 55 8 #VALUE! #VALUE! #VALUE! Combined AGOA imports (including GSP provisions) 4,655 3,765 #VALUE! #VALUE! #VALUE! Combined AGOA imports (including GSP provisions) 6,132 6,905 #VALUE! #VALUE! #VALUE! Combined AGOA imports (including GSP provisions) 756,608 722,678 #VALUE! #VALUE! #VALUE! The history of COMESA began in December 1994 when it was formed to replace the former Preferential Trade Area (PTA) which had existed from the earlier days of 1981. COMESA (as defined by its Treaty) was established 'as an organisation of free independent sovereign states which have agreed to co-operate in developing their natural and human resources for the good of all their people' and as such it has a wide-ranging series of objectives which necessarily include in its priorities the promotion of peace and security in the region. However, due to COMESA's economic history and background its main focus is on the formation of a large economic and trading unit that is capable of overcoming some of the barriers that are faced by individual states..
COMESA's current strategy can thus be summed up in the phrase 'economic prosperity through regional integration'. With its 19 member states, population of over 389 million and annual import bill of around US$32 billion with an export bill of US$82 billion COMESA forms a major market place for both internal and external trading. Its area is impressive on the map of the African Continent covering a geographical area of 12 Million (sq km). (Source: COMESA Secretariat). Not all COMESA member states are also AGOA beneficiaries. Notable exclusions are Zimbabwe and the DRC (the latter was suspended, the former was never included), while some countries from North Africa (Egypt, Libya) are excluded from the provisions of the legislation as they are outside of the Sub-Saharan Africa area. The trade stats provided here therefore only relate to AGOA beneficiaries. 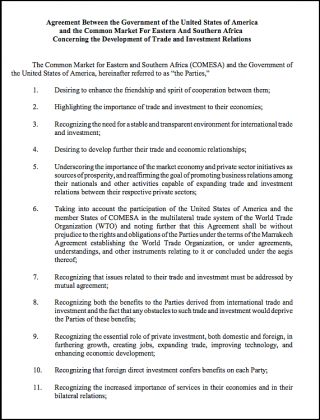 Agreement between the Government of the United States of America and the Common Market For Eastern And Southern Africa (COMESA) concerning the development of trade and investment relations.